Each LLC or corporation that is launched in the country has to take care of additional requirements. For this, there are many additional forms that the company would need. If you are a client of IncParadise, you would be able to use these additional forms for free of use. So, if you are not yet our customer, contact us today to avail and enjoy our services. And if you are our customer, below shared are the forms that you might need for your corporation or LLC. This meeting is an important one as it specifies the ownership of your corporation. And there are two methods for looking at the very first directors meeting. The first way is to cover anything and everything within the initial directors meeting minutes. This can include things like the ratifying actions and bylaws of the incorporators, issuing shares of corporate stock, resolving to open a bank account, setting their salaries, electing officers, and assigning the signing power to the hired Secretary so that they can sign for everything that the Corporation needs. On the other hand, you can skip the complete thing and just deal with everything in the articles of incorporation, bylaws, initial incorporator resolutions, and a simple bill of sale that would show everything that the shareholders have given the company as funding and how many shares belong to these shareholders in return to the investment they offered the company. But it is important to record the Minutes of Initial Directors Meeting as per the government. And for this, IncParadise offers the existing client this form for FREE. All these documents are online-generated ones. And the client that has an account with IncParadise can access the corporation forms easily. 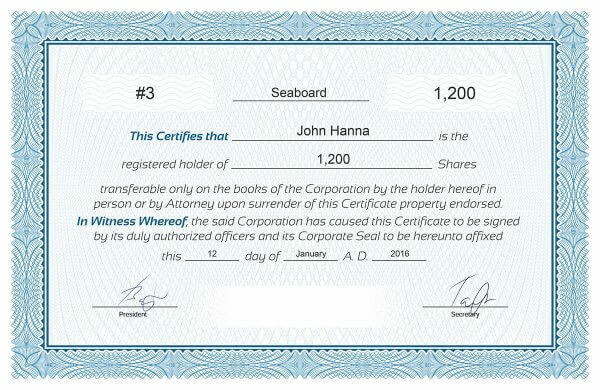 Another corporate form that you would need is the stock certificates that are offered to every new owner (including shareholders) that comes into the company. 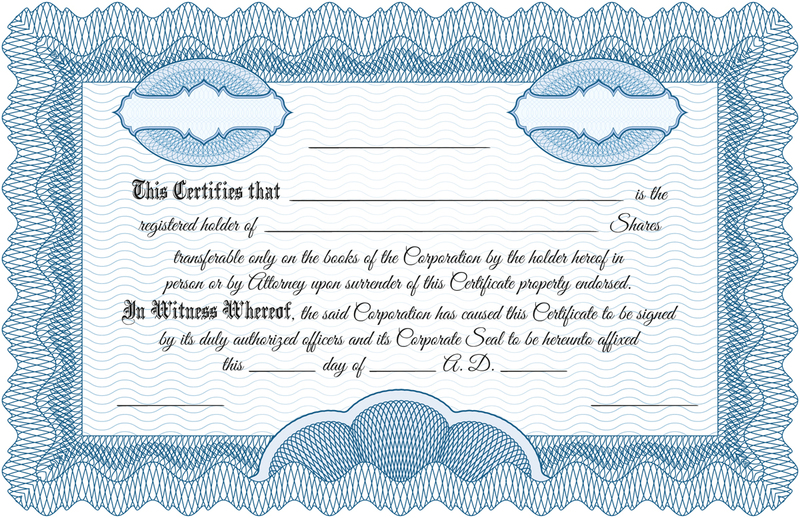 Stock certificates are a written certificate that shows the issuance of shares of the corporation. As soon as a corporation is formed, the articles of incorporation authorize a specific amount of shares in the company’s stock. When the shares are authorized, the company then issues all or some of the shares from the stock to the shareholders in exchange for funding the corporation. This one of the corporation forms that are important when the company issues any shares. It is a simple note on a paper claiming that a specific amount of shares have been sold to the person. 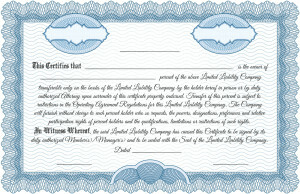 This form is called the Certificate of Stock and is printable on the regular paper or any paper that you find good. With the advancement in things, there is a new option where you can easily issue shares electronically. IncParadise has a sister company named Eqvista that allows owners to easily issue and manage their shares electronically through an advanced cap table application. This option would help you eliminate the use of paper and would also help you to track everything online easily. Click here to know more about it. And if you still want to use the paper Certificates of Stock, then you can get the form here, only if you are already an existing client of IncParadise. The first directors meeting is different from the shareholders meeting. Just like the directors meeting is important to record, it is also important to record the minutes of the first shareholder meeting. As a matter of fact, it is an organizational meeting that takes place to elect the officers and directors (if it is a small held corporation), along with agreeing and ratifying all the actions performed by the incorporator. The initial directors meeting can take place at the same time in case every shareholder is a director or there are non-shareholder directors present in the company. The meeting includes viewing the articles of incorporation. Being a part of the initial team, everyone would have to elect the initial officers of the company or approve any appointments on the articles of incorporation. Everyone would also have to elect the initial directors of the company or approve any appointments on the articles of incorporation. The meeting document would have to hold details regarding the amount of shares that each person holds or have been issued with. The issuance of share agreements and the values of the shares have to be included and documented as well. The next form that you would need in your corporate is the one for the Corporate Bylaws. These are basically the “rules” that are made to explain how a corporation should operate. A corporation would need this document at the beginning of the business life in most of the states. It is obvious that the very first document needed by a corporation is the Articles of Incorporation. But, after the document is prepared, it is important for most of the corporations to prepare all their Corporate Bylaws. The Bylaws would be the document that would that states the complete operational structure of a corporation. These Bylaws would cover some of the main parts of the corporate business including shareholders, directors, officers, and meeting information. Additionally, the corporate bylaws can also be created for a non-profit corporation that has most of the same provisions except any that is related to shareholders. What is in the form? In the Corporate Bylaws document, you would have to fill in the general information about your corporation, which can include the name of the corporation, the type of corporation you have and the state in which you have incorporated the company. After that, you would have to add in the additional important details. In this document, you would have to answer questions for the annual meeting of the shareholders including the information regarding the agenca, time, date and other details. After that, you would also have to fill in the details for the Board of Directors, and answer questions like information on their own meetings, how many directors there will be and more. Moreover, at the end of the document, you would have to reveal the details about the financial decisions and the seal of the corporation and many other details. As soon as you fill the document, it is much better to print out the document and get it signed by the relevant party. The relevant party here would either be the incorporator or the Secretary of the corporation (which is normally the agency that helps you to incorporate your company like IncParadise). This document would then be kept on the file of the corporation for as long the company exists. Each state in the US has specific laws for the Corporate Bylaws document. A lot of the states in the United States specify that the corporate bylaws needs to be adopted strictly by the company’s Board. And whatever goes into the Corporate Bylaws document is entirely based on what the corporation wants to add in it. Another document that you would need is the stock ledger that is used to keep a proper record of all the stock transactions for your corporation. As a matter of fact, it is an essential part of the corporate records book. The stock ledger is normally there in the corporate records kit and it is a compulsory thing to maintain the book. This means that if there is any transaction of shares in the company, regardless of it is an initial issuance of shares or any subsequent transfer, it has to be entered in the stock ledger. The stock ledger can be an application or a book, or even just an excel sheet. But it is important to keep note of the stocks of the company at all times. The best way to do so is by using an application that is called the cap table application. Eqvista is a sister company of IncParadise and is a FREE cap table application that you can use to track and manage the shares in your company. It would also help you in staying compliant with the stock laws in the state and country. Check out more about Eqvista here! Using the Eqvista app, you would not have to worry about missing any detail of a share transaction. The process would make things simpler for you to keep track of all the shares in your company. So, instead of using a document as the stock ledger that can become complicated later on or instead of using the excel sheet, use Eqvista to make things simple. Moreover, the application is FREE to use, which means that you have got nothing to lose. The very first form that you would need is the document that would record the first organizational meeting, which is the first meeting of the members of the LLC. Before you can conduct this meeting, you would need your operating agreement and the filed articles of organization. Record all the members who are present for the meeting. Make sure that the minimum number of members needed are present in the meeting held. Elect a secretary for the meeting so that they can record the meeting minutes. In case the LLC is a manager-managed one, elect the managers for the meeting. In case the LLC has any officers as per the operating agreement, elect the officers. Decide and fix the salaries for the managers. Review, approve, adopt and ratify the articles of organization that was filed with the secretary of state. Resolve that the LLC would compensate all those who organized the company for their expenses in forming the LLC. Analyze, authorize, ratify and adopt the operating agreement for the LLC. Analyze and authorize the initial capital contributions of every member who would fund the LLC. Resolve to start business operations. Resolve to open a business bank account for the LLC. Discuss and decide about the next date of the annual meeting or if there would be an annual meeting at all. Memorialize membership interests like issuing the membership certificates. Agree with the members to report the LLC expenses and income on an annual or any other basis with the department of revenue. Record any other matters that needs to be discussed about. Make all the members sign the meeting minutes of the details shared above that should be prepared by the secretary. You can get the document that would help you note down all the meeting minutes of the first organizational meeting here. 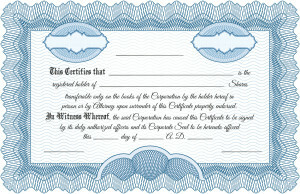 Unlike corporations that use stock certificates, LLC uses the membership certificates that determines the ownership. To be sure about what you would need to issue in your company, you can check your articles of organization of whether you need to issue the membership certificates to the document ownership. 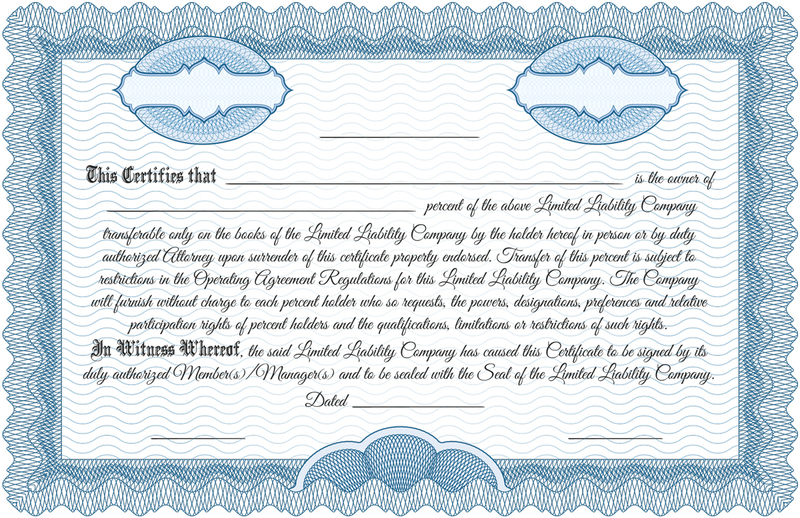 In short, only the LLCs that are evidenced by membership certificates have to prepare and issue certificates. The benefits to which the owner is entitled. The name of the LLC and the state in which it has been formed. The number of members that the LLC has on the date of certificate issuance. The name of the owner of the certificate along with the percentage ownership it represents. An authorized member, mostly the secretary has to sign as a witness. Now that you know what forms you might need for your company, you can get these corporation forms and LLC forms from IncParadise for FREE. Just remember that you need to be an existing member to be able to avail and use these forms. In short, if you are already a member, you don’t need to buy Corporate kits. All the documents are provided at no additional cost on your client account. Moreover, if you have not yet registered your company with the US government, the IncParadise can help you with it. Contact us today to get your company registered in the US state you want to build your business in!